When you are out in the woods for a week at a time, you come across all kinds of sights, smells — “Whoa! What the heck is that: A manure factory? Something decomposing? Oh, wait, it’s just me after seven days without a shower.” — and people. You never forget seeing your first moose, and you can never, ever shake that hiker smell. But the most memorable thing for me has been the interesting people I have met. There are untold stories of people who begin their hike of the AT alone, only to find their future spouse or lifelong friends on the trail. Some hikers meet that first week and spend the next 2,000-plus miles together. It happens. A more common occurrence, however, is when groups form but then fall apart because of personality clashes, differences in speed or conflicting agendas (the need for rest or injuries and illness). The mantra on the trail is “hike your own hike.” In other words, do what is best for you so you do not spoil this incredible experience. When I stopped for 36 hours in Rangeley last week, I had the pleasure of meeting four guys who had thrown in together the month before. They came from different backgrounds and states and enjoyed each other’s company enough to compromise on their hike. People have trail names, and then they give names to their groups. These guys called themselves the USS Bennington after one of their favorite towns on the trail. The crew, from left: Hughey, Cleveland; Rabbit, Pennsylvania; Yoohoo, Miami; and Cambo, Indianapolis. We caught a ride into town and had a couple of dinners. (Well, I had two dinners that night; my hiker hunger is starting to kick in. Two of these guys had THREE dinners. Kobayashi and Joey Chestnut have nothing on long-distance hikers.) These guys have spent so much time together eating bad food, living in the squalor of the outdoors and giving each other a hard time, it reminded me of college. It was a blast. Only Yoohoo had a deadline. He was meeting his father at Mount Katahdin to share his triumphant finish to his four-plus month journey with his old man. After summitting, Yoohoo had to rush home for the start of school at Florida International University. Hughey, Rabbit and Cambo had no reason to rush. There were other snags: One guy wanted to take a zero (a day off in town). One guy was a machine who could hike 40 miles in a day. One guy wanted to hit each remaining town on the trail to sleep in a bed every few days. But each got out his guide and worked out a compromise plan that could work for all. Pinkie promises were made, and the USS Bennington left town planning to finish their tour together. It was just a day and a half, but the USS Bennington helped make my hike. They are close to finishing, but if you’d like a bigger-picture view of an AT through hike, check out Cambo’s blog at trailjournals.com/cambo. Not only can this Hoosier double up my miles in a day, but he writes a blog EVERY night. Now that’s impressive. I’ve met so many wonderful people on the trail but wanted to share one more quick story about a trio that inspired me. I spent my first night in New Hampshire in a shelter with Jason, Eric and Kevin. They are three old friends who meet one week a year on the AT. They have been doing it for a decade. They finished New Hampshire this week and will start on Maine next summer. Talking with them reminded me of my old college buddies. We used to meet each March in Las Vegas for the NCAA tournament. It was our way of keeping spring break in a grown-up’s world. I loved it. I miss it. But at my age, I was more impressed with Jason, Eric and Kevin’s plan. They remain connected and share a goal, and each year they knock out 30, 40 or 50 miles of one of America’s true treasures. Happy trails, fellas. You guys are doing it right. It’s probably that I’m a city/town/suburban guy, but I prefer the privies to ducking off trail and into the woods. 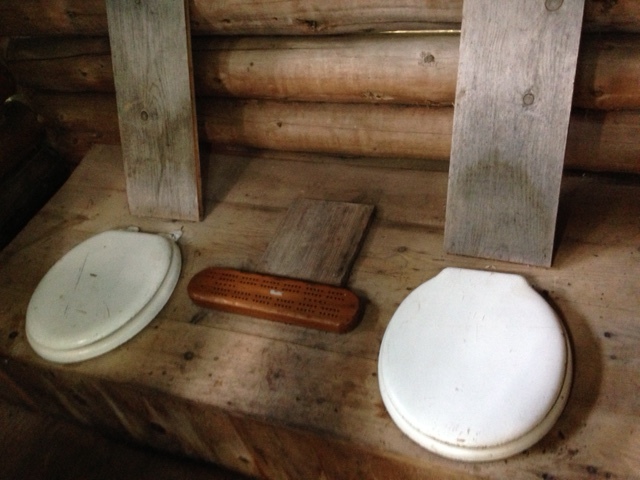 I have come to love the AT’s privies. One in particular has captured my heart: Piazza Rock Lean-to’s privy. I first heard about it 60 miles north and could not wait to find it. It was glorious, everything I’d imagined and more! I waited around for an hour, hoping to find a pickup game. Maybe no one had to go. Perhaps people were creeped out by the smelly bearded dude loitering at the loo. Whatever the reason, no one showed. It’s probably for the best, though, since I don’t know how to play cribbage. Yesterday was a day I’d like to forget. After a month in Maine, I finally made it to New Hampshire on Sunday. (I LOVE Maine. I really do. But I was so relieved to make it to my second of 14 states on the trail. It was the mirage of progress, I guess.) And Monday, I knew I would reach town, Gorham. But the day started badly and somehow got worse. Monday morning, I was hiking with a bounce in my step. I was making good time. I could almost taste the fast food awaiting me. Then I took a wrong turn. I followed another hiker down a side trail. The blazes — the paint marks on trees that show you the way — were blue, not white. Blue means “side trail” or “water,” but we figured New Hampshire just must be backward, so we hiked on. We had a great pace going, and it was all downhill. Our guide showed some ascents mixed in with descents. We shrugged it off. Finally we stopped. We had taken a wrong turn. The other hiker decided to keep going, to follow the stream out to a road and hitch into Gorham. I was tempted but came out here to hit every blaze on this trail. I turned back. When I got to the fork in the road, I went the other way. This time, the blazes were yellow. “Yellow?!? What does that mean?” I grumbled. Still I followed. I hiked most of a mile, and the blazes stopped atop a mountain. “We must have taken a wrong turn even earlier than we had thought,” I decided. I turned back and hiked even farther back up the trail. In another mile, I came to another fork in the road. We had gone left when we should have gone right. Three hours later, I corrected my mistake. THREE WASTED HOURS! My 11.8-mile hike had turned into 16 or 17 miles. 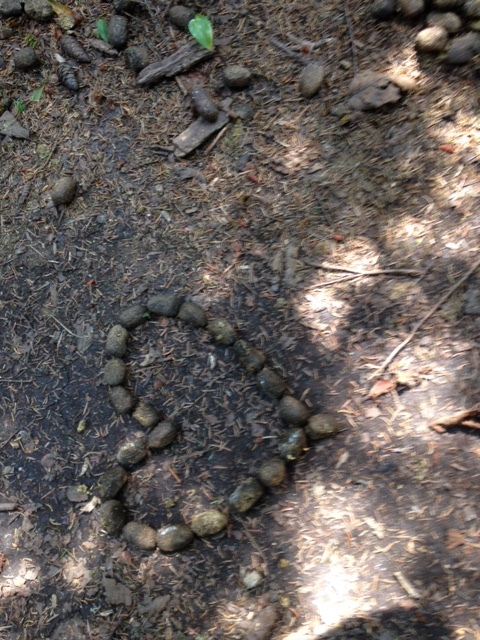 Back on the right trail, I came across someone’s art project, made of moose poop. It was probably a hiker’s work, but I preferred to think of it as a sign from above: $hit happens. So I hiked on. I was late, very late, but I refused to give up on my dreams of Gorham. So i hiked onward, stopping only for water and food. Every day on trail, I take off my boots during food breaks. Letting your feet air out makes all the difference when you spend 12 hours stepping over rocks and roots. Every day, those boots come off. Every day, that is, but Monday. Each step hurt worse than the one before. By the time I arrived in town a little before 8 p.m., my toes were throbbing. It took more than a month, but I had finally butchered my feet, leaving the tops of my toes blistered and raw. My feet hurt, but not as badly as my heart. When I left for this hike, I had promised my children that I would write them each at least one postcard a day every day of my hike. After 33 days in Maine, I had written 88 postcards to Forrest and Marlowe (1.33 each per day). Monday, I forgot. Something tells me Monday is one day I will never forget. Thanks for reading and sharing this adventure with me. Steve, I’m wondering on what device are you writing this blog? Did you bring a little keyboard with you? Is WordPress easy to use? Are you finding wifi in town or are you subsisting on cellular? All and all, it’s a great read. Libraries in town, Janet. I think while I hike, then I kill a few hours at the library when I get into town. Thanks for reading and all your support on Twitter! Glad to see you made it thru Maine. Get you feet bandaged up and march onwards! 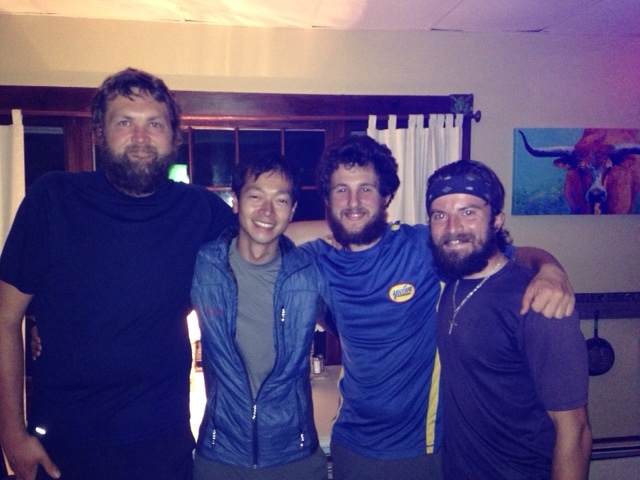 I just wanted to let you know that these four guys did make it to Katahdin together today. 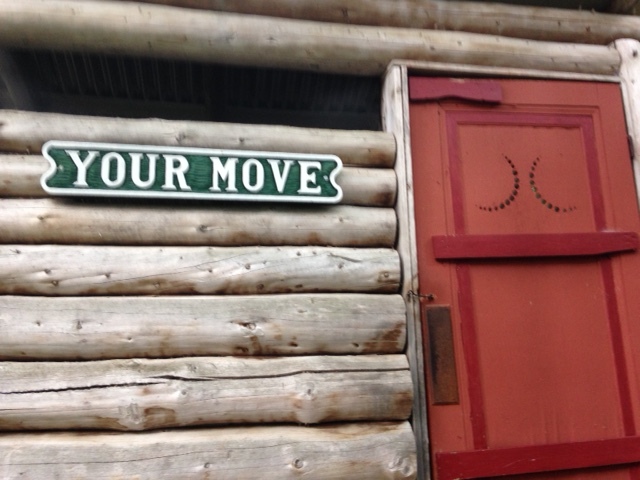 I’m staying with them at AT lodge in Millinoket. Also, Scout at the trail magic cabin had printed out your post about trail magic and was showing it to people when I stopped there for beer. You are making impacts on people. I’ll be looking forward to reading your next story! Many Faces, thanks for your comment — and the news about Scout! I’m glad he is back at the cabin giving out trail magic. Those guys made our day when we were struggling in the 100 Mile Wilderness. Sorry I did not respond sooner. I have been off the trail since late August, when I fell and broke five ribs in the White Mountains. I had to come back to Indiana for a week, but the injury has kept me on the couch for a month. I can’t wait to get back out there: I fly out Wednesday and get back on the trail Thursday morning at Franconia Notch. Thanks for reading and good luck at Oberlin. Do you ever run in to Tree Beard on campus? It’s a small world! Thanks, Alex! I survive by making sure I get enough to eat and drink. I carry whatever food I need, so I have to plan how many days I will be in the woods and buy enough food to get me through. For water, I stop at streams, rivers and ponds and make sure to filter all the water I need to drink. If you don’t filter your water — I use a hand pump that takes out the bacteria — you can catch Giardia, a parasite that makes you very ill. Sometimes you can get Giardia even when you filter. So far, so good, though. Thanks for reading! Great to see you’re still pushing on. Know that I plan to be one of your biggest fans. I summited Katahdin on 21 Aug and have since made my way back to the flyover state. You’re a great writer with a moving story and I appreciate the kind words. It was a pleasure to have spent time together. If you still plan to be home or currently are, shoot me a message to let me know. I never received a text so I don’t have your #. I gotta make sure you get back out there. Cambo, sorry it took so long to get back to you. I fell in the Whites and broke 5 ribs. My week off in September will have stretched to five before I get back on the trail Thursday. I’ve been a lazy slob. It doesn’t help that my side hurt like hell. The key is, though, that I am getting back on the trail. Way behind schedule and only 375 miles complete, but I’m returning. It was great meeting you, and I hope to see you in January (if I’m back in January).